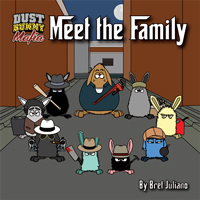 The Dust Bunny Mafia isn’t dead! I’ve just been working pretty diligently on a super secret story arc for the end of The Blind Tiger comic collection coming out later this year. Welcome back, man! Been missin’ you.